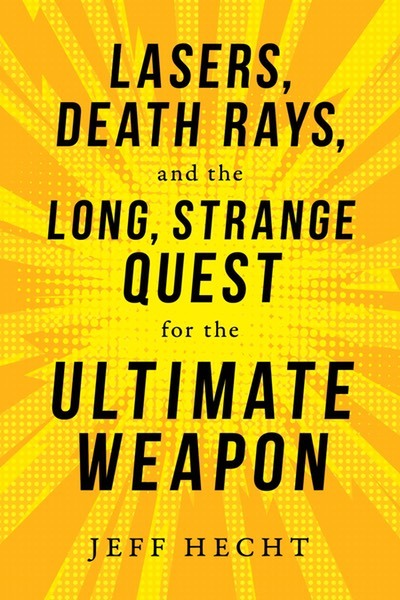 Lasers, Death Rays, and the Long, Strange Quest for the Ultimate Weapon (Prometheus Books, 2019) tells the story of the quest for energy weapons, from the time the ancients armed their gods with lightning bolts to the new generation of prototype high-energy lasers being tested by military agencies around the world. Available from Prometheus through Penguin, from Amazon, and from other fine booksellers. Legend tells that the ancient Greek scientist Archimedes set Roman ships on fire by focusing sunlight on them. It's a great story, but we have no evidence it really happened. In the early 20th century, armies sought to use the new power of electricity and radio to make "death rays" to end the fearful aerial bombings enabled by the newly invented airplane. Yet even the great Nikola Tesla could not make one work. For a while, military planners abandoned hope. Sixty years ago, Gordon Gould walked into the Pentagon with plans to build what he called a "laser." With the specter of nuclear doom looming after the Soviet Sputnik launch, military scientists were all ears. Gould convinced them the physics was real, and top brass approved a million-dollar contract. But the Pentagon's security officers refused to give Gould a clearance to work on the project because he had been a communist. Others built the first lasers as newspapers ran stories about "The Incredible Laser," but the early lasers couldn't vaporize anything bigger than a bug. The Pentagon was about to pull the plug on their laser plans when rocket scientists showed they could extract generate laser light from what was essentially a rocket engine. Adventures followed. The Air Force spent several years squeezing a rocket-engine laser into a military version of a 707, but firing the rocket-engine laser made it hard to get the beam to hit anything. As that adventure was winding down, a new idea was emerging: building fleets of space-based rocket-engine laser battle stations to shoot down Soviet nuclear missiles. Plans were in the works before Ronald Reagan reached the white house, but it was Reagan who started putting serious money into big defense plans. Edward Teller had a scheme to power space-based lasers with nuclear bombs, but that fizzled out even before Reagan and Gorbachev started to wind down the Cold War. After the Berlin Wall came down, the Air Force decided to put a new laser up in the air. The Airborne Laser was a megawatt-class laser that barely fit into a Boeing 767. It ran years behind schedule and billions over budget, but in 2010 finally shot down a target missile, only to have plans to build more of the giant laser planes shot down by the Pentagon because they weren't up to the job of shooting down ballistic missiles launched by rogue states. Meanwhile, however, a joint U.S.-Israeli program had shown that rocket-engine lasers on the ground could zap insurgent rockets out of the skies. Hard-nosed field operations specialists found rocket-engine lasers too cumbersome to put on the battlefield, but new electrically powered lasers came to the rescue, based on technology used for laser machine tools. Installed on military ships and trucks, those lasers have zapped rockets, artillery, drones, and small boats, and a new round of prototypes are being built to see how well the lasers can work in real military conditions. It's only taken sixty years, and the final results aren't in yet. Lasers, Death Rays, and the Long, Strange Quest for the Ultimate Weapon is available from Prometheus Books. Also available from Amazon and other fine booksellers.